I have been a client at DogAmerica for 3 weeks now; and we could not be happier with the service provided. After working all day and going to school at night I don’t know how my dog would get the interaction and exercise he needs without the help we get from DogAmerica. He gets to play and practices his manners and training while at daycare. We love the report cards at the end of each day. This is a great option for everyone to keep their dog socialized and keep training and good manners fresh and consistent. By the time I walk around her side of the car she is standing up in her high rise tethered car seat. All those behaviors tell me Mazy can’t wait to get inside the door of her daycare to meet and greet “her” people and K9 friends. This is one of her “happy places.” I know she is treated well and gets the interaction and stimulus she needs. “DogAmerica” has educated staff on duty who train and reinforce accepted animal behavior training techniques, all of which Mazy needed. Mazy now has “4” on the floor when greeting people, comes when called and does a stay/down until called. As a young terrier mix these have been a challenge for both Mazy and me. Of course as Mazy’s mom I need to keep up the homework. I am very impressed with the super clean facility. Dogs defecate and urinate by scent and not by location. 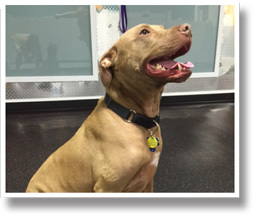 Having an all inside dog care has NOT led to ANY at home accidents. 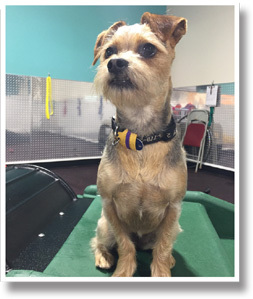 Mazy and other K9’s that run and play at “DogAmerica” quickly learn to adapt and use the assigned scent location. Thankfully they think like dogs not like people. The large bank of windows supply an abundance of natural light. Mazy loves the unique play equipment and the staff to K9 ratio at “DogAmerica.” She really gets a lot of one on one attention. Mazy returns home played out but not exhausted. The required nap/down time at “DogAmerica” has proven to be a benefit to Mazy. This down time is research supported and yes it works. What a fun place for her to spend some of her days and how great that I don’t have to worry!! Thanks to “DogAmerica” for thinking about all that a K9 needs. 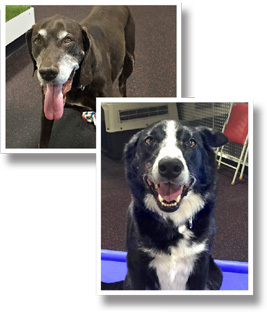 My 13 year old GSP and 6 year old Border Collie absolutely LOVE going to DogAmerica! The staff has quickly become Oskar and Axel’s new best friends and you would not believe how excited they get when we pull into the DogAmerica parking lot. The special attention and training has been especially beneficial to my Border. Cool place, we’re lucky to have in our neighborhood!